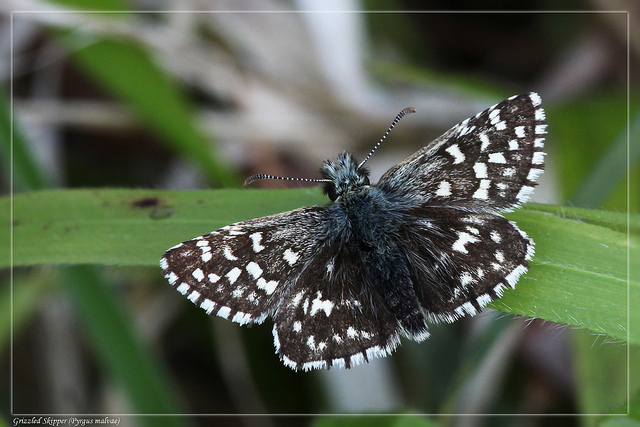 The Grizzled Skipper is the first of the skippers to emerge. The butterfly is dark brown above, fringed with white, with a checkerboard pattern of white spots. Like the other skippers, this butterfly is a fast flier which can be difficult to follow due to its ability to vanish during its erratic flight. Both sexes can be found basking in the sun perched on bare earth or stones in a sheltered spot. It may occasionally nectar on spring flowers such as Buttercup or Bird’s-foot-trefoil. Normally from mid-April until the end of June. This butterfly occurs in a variety of habitats where warmth and shelter is available along with its larval food plant. Habitats including chalk downland, disused railway lines, woodland rides and woodland edges, unimproved grassland and waste ground. These habitats should also provide patches of bare ground where it can bask. Resident, widespread but scarce and local, declining both in abundance and distribution (North and West). Latest county record, 15 July 1986 Picket Wood (Mike Fuller).